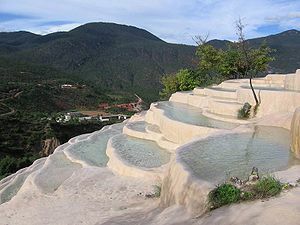 Natural mineral terraces next to Baishuitai village between Lijiang and Shangri-La County in northwestern Yunnan province, China. Located slightly north of Haba near the upper Yangtze river valley. This article uses material from the Wikipedia article "Baishuitai Terraces", which is released under the Creative Commons Attribution-Share-Alike 3.0 License.